The turn of the Millennium has been popularly associated with “the dawning of the Age of Aquarius,” but do you really understand what that means? Well, I’ll tell you. The astronomical answer is that the Vernal Equinox (an imaginary point in the sky marking the location of the Sun on the first day of Spring) has drifted into the constellation Aquarius. This point cycles around the sky once every 26,000 years, spending about 2000 years in each of the twelve constellations of the Zodiac. It is currently located in Pisces. It will not enter Aquarius until around the year 2550. So the “Age” may be “dawning” but it’s still quite a ways off in time. 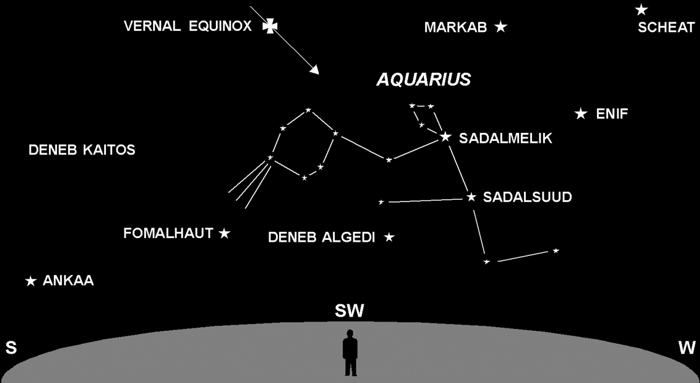 Aquarius (The Water Bearer) is a faint constellation. It’s visible only in very dark skies, yet its mystic impact on history is purported to be significant by astrologers. Each of the twelve “Zodiacal Ages” is said to exert a strong influence on Earthly affairs — the Age of Aquarius is to be one of peace, harmony and understanding. At least, so say astrologers. Scientists don’t believe in astrology, but the concept of an age of peace is nonetheless enticing. The most important question might be: Do we really need to wait 550 years to see this vision unfold?